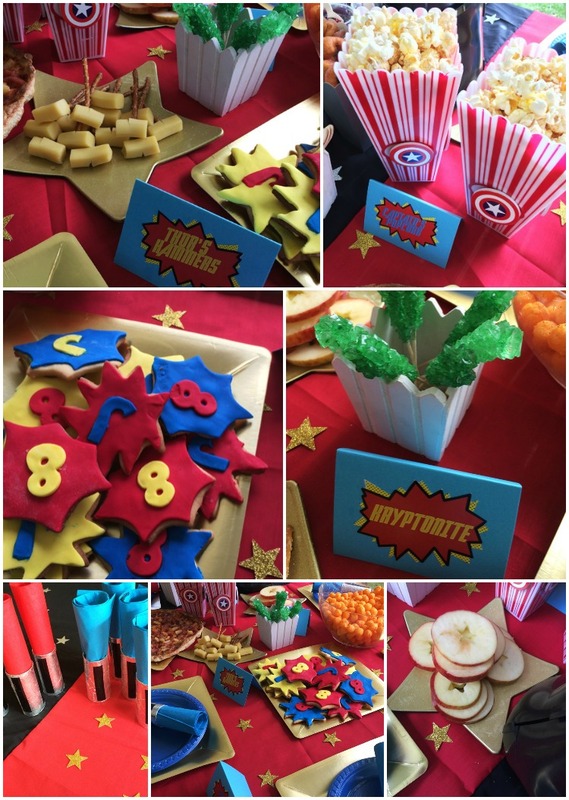 What do you do when your baby turns eight, and he wants to have a party that encompasses all his favourite things? 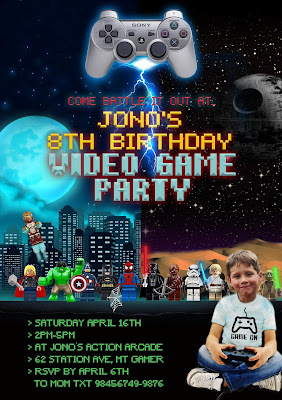 He loves Star Wars, he loves Super Heroes, he loves Video Games - and he just can't decide what kind of party he wants. Well, if you're me (and you're slightly mad) you find a way to to mix all three themes together. 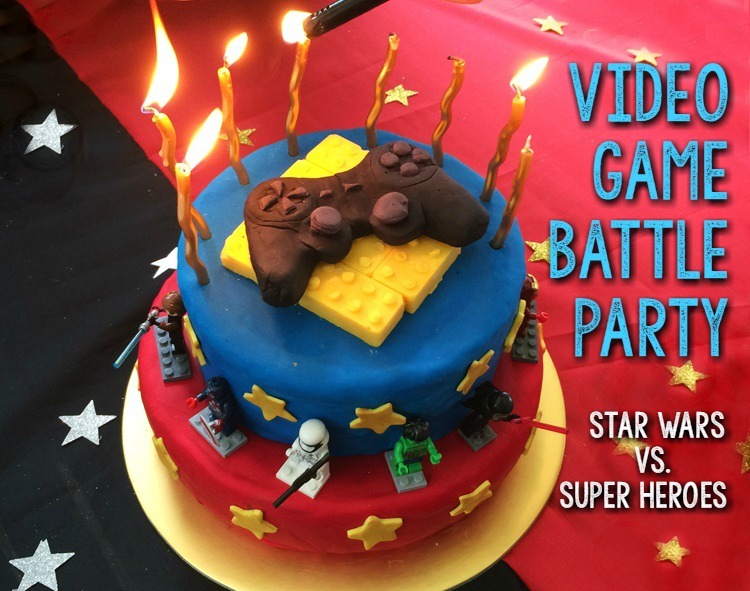 You and the birthday boy put your heads together and dream up an action packed "Video Game Battle Party: Star Wars vs. Superheroes". It's like having three party themes in one, really. 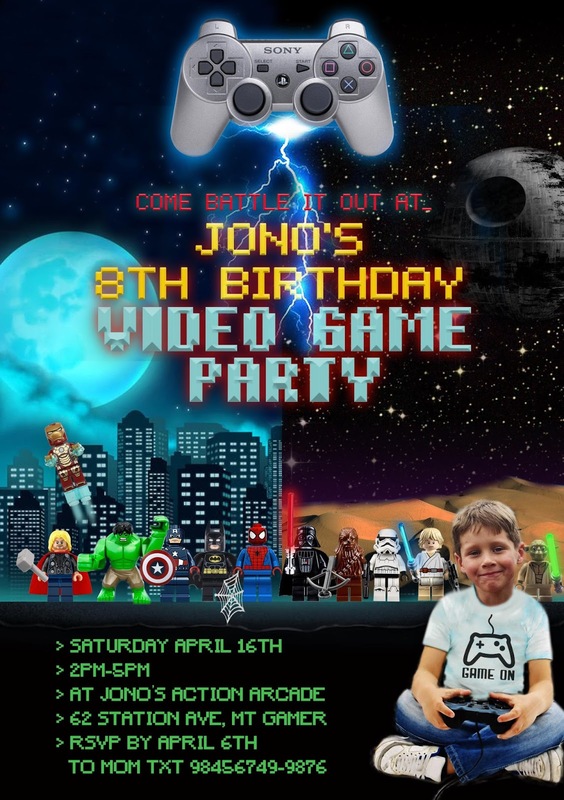 But you reckon you can pull it off because you've done Star Wars before (and already have loads of stuff), you've always wanted to do a Super Hero party and the video game thing can tie the other two themes he loves together. 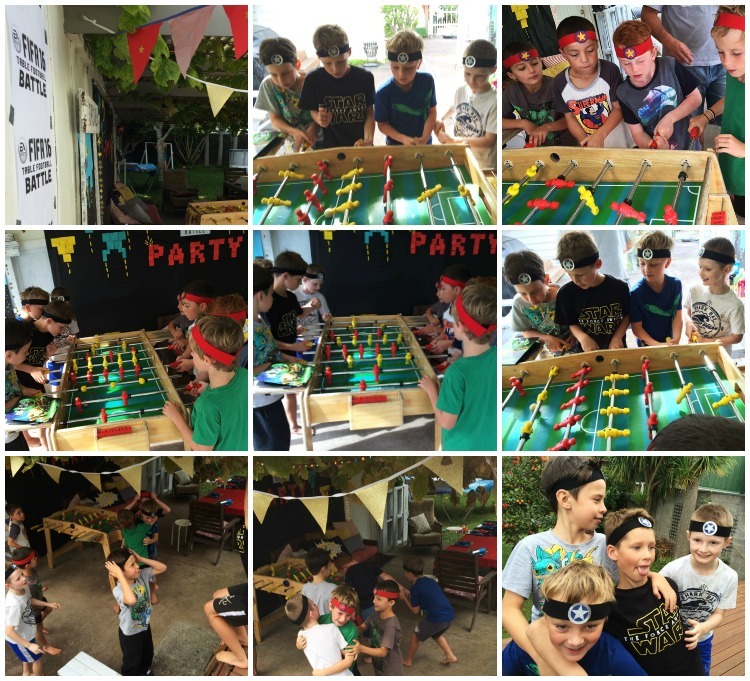 So here we go - a crazy, action packed, Video Game Battle Birthday (which did not involve much actual video gaming) but was LOADS of fun for all. The backdrop for the party area was made from two cheap black plastic tablecloths ($2 each) duct-taped to the wall. I used Post-its to create classic video game "space invaders" and signage. It was a bit windy and the post-its didn't stick too well when a gust came blowing through, so I used doubled-over duct tape to secure the Post-it's to the background, extra firmly. Duct tape is magic. 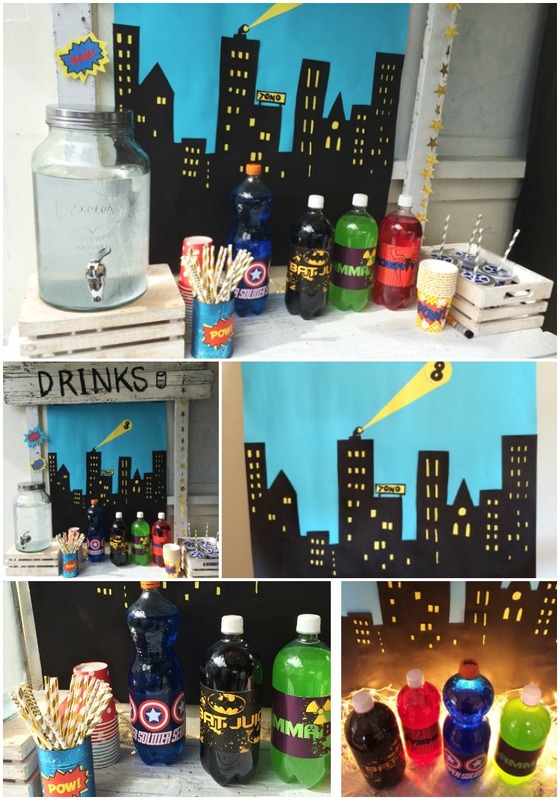 The drinks stand was a real feature, with my cut-paper city as the backdrop, and soda bottles themed with printables I created. To combat all the sugar (and because I know battling it out is thirsty work) I filled my drinks dispenser with plain iced water. 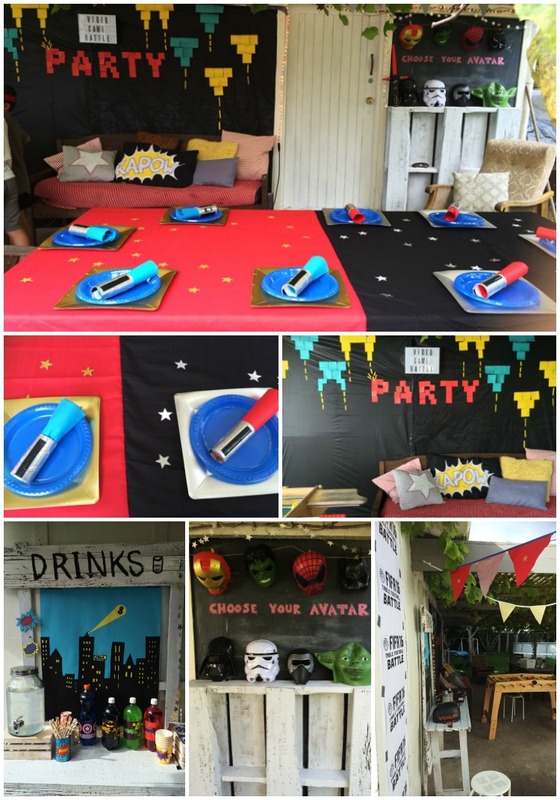 The table was split into two halves (Star Wars vs SuperHeroes) by sewing pieces of red and black fabric together for a table cover, and then scattering silver and gold glitter stars on top. 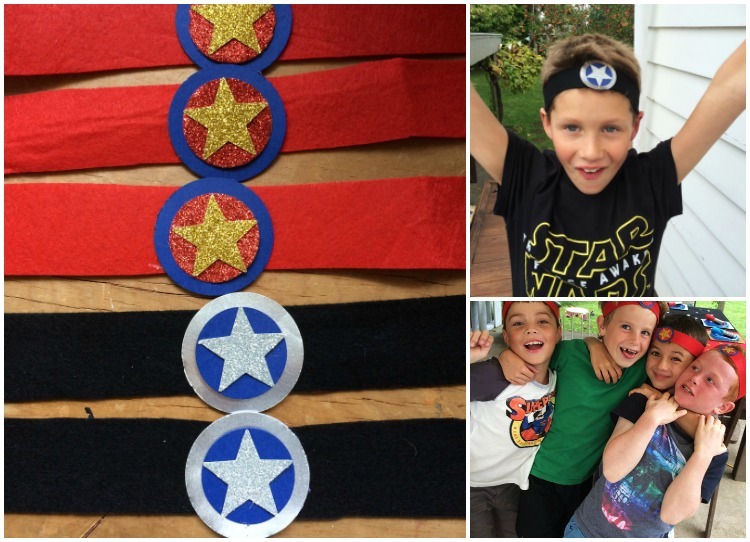 Red+gold stars = the Super Hero end. Black+silver stars = the Star Wars end. There was also loads of bunting strung up everywhere. Gold. Silver. Red with gold stars. Black with silver stars. You get the idea. 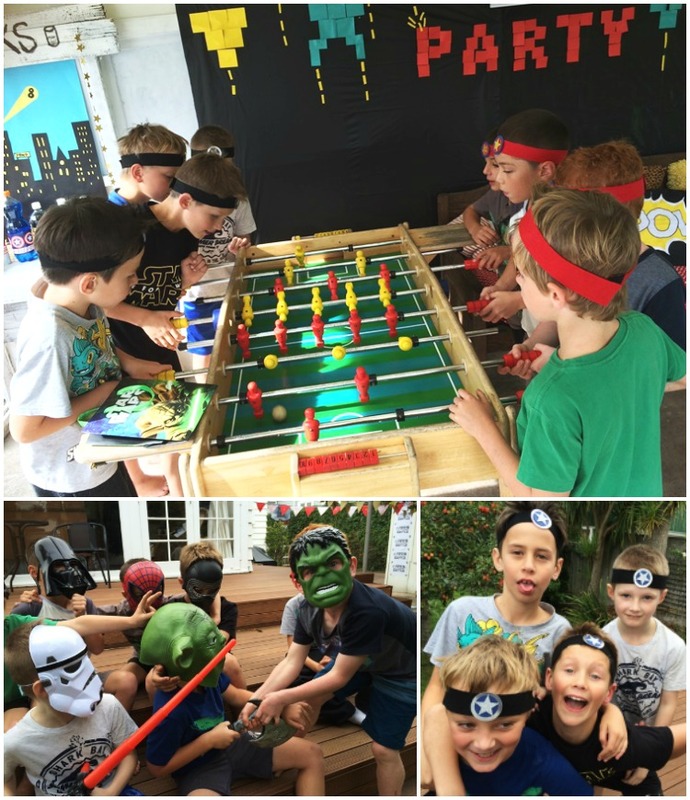 Scrag's whole idea for the party was to have two teams (Star Wars vs Super Heroes of course) who would engage in various "battles". 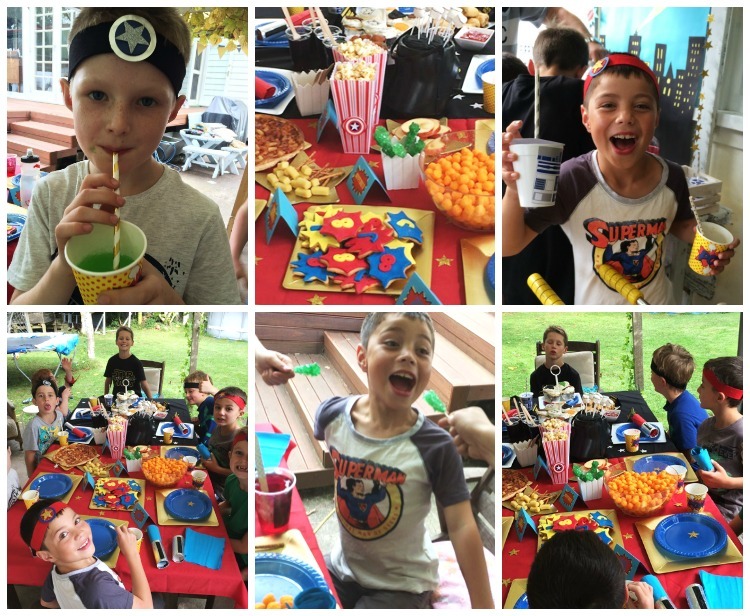 This may have been called a Video Game Party, but it was mostly live action. 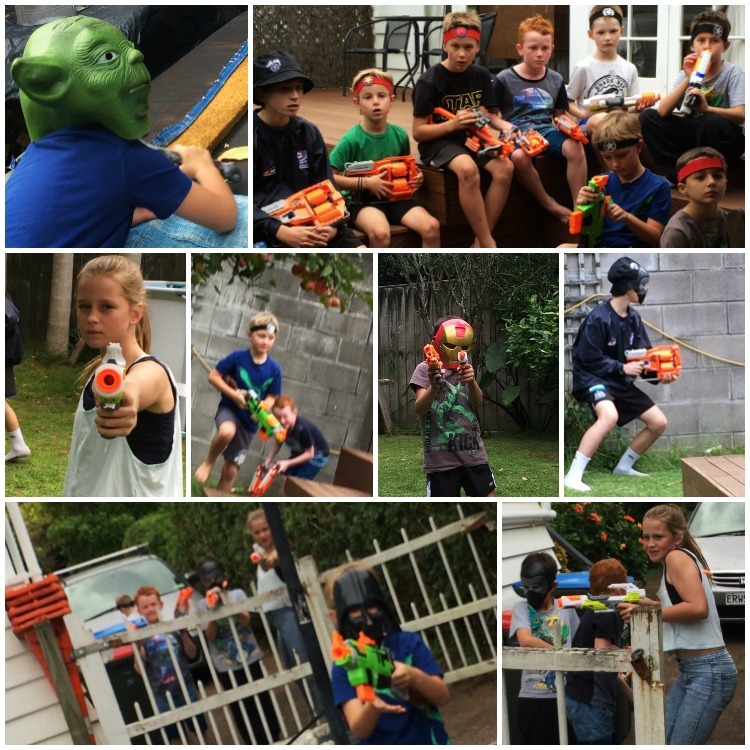 I collected cheap Star Wars and Super Hero Masks for each team from various places (Ali Express, TradeMe, dollar stores) and these would become the "avatars" for the Nerf Battle of capture the flag. (1) Am I having fun? and (2) Are there yummy things to eat? 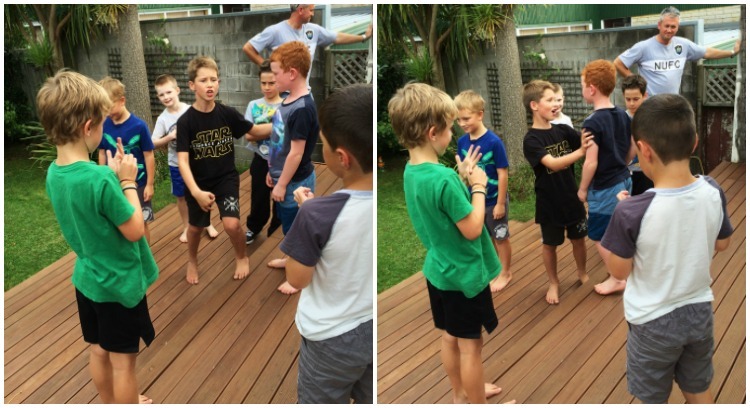 Scrag knows his friends well, and being a high energy eight-year-old boy himself, he planned the activities perfectly. Yes, you heard correct. HE planned the activities. Our birthday boy has very definite ideas about how his party will go. All I have to do is interpret them, and make them happen. Basketball. Scrag wanted a real live basketball game. 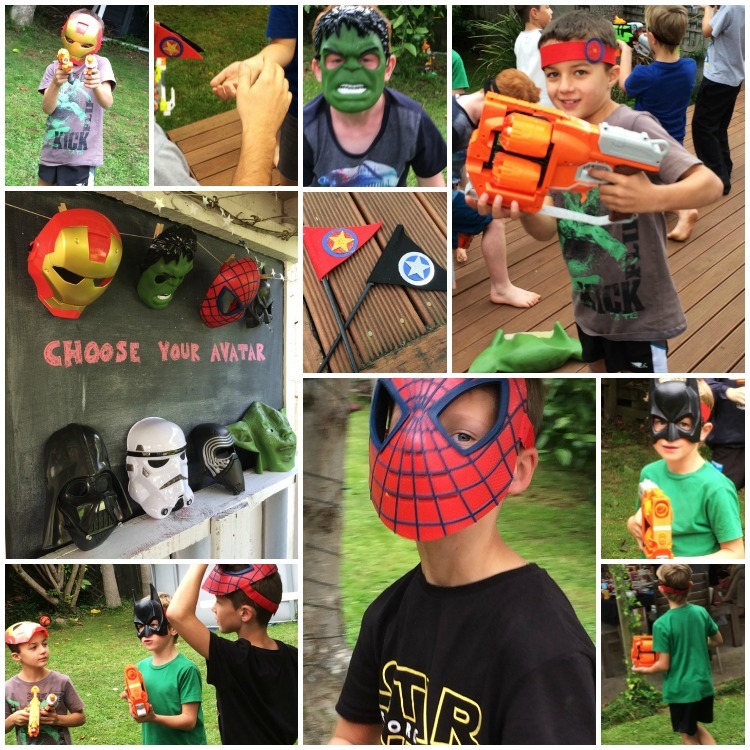 Capture the Flag, with Nerf guns. After all that action (and a few skinned knees and scraped toes) it must be time for some refreshment, right? 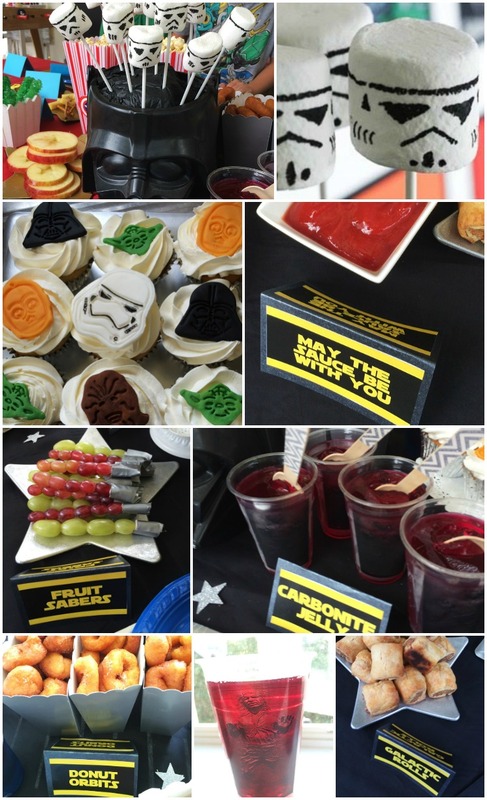 The kids got a kick out of asking, "May the sauce be with me...?" Ha. Ha. 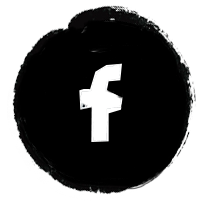 OK, are we rested? Has that food settled? Time to really battle it out now, boys! This was sheer joyful mayhem. After a while all thought of capturing anyone's flag flew out the window, and it was just WAR, Star Wars dudes vs. Super Heroes. 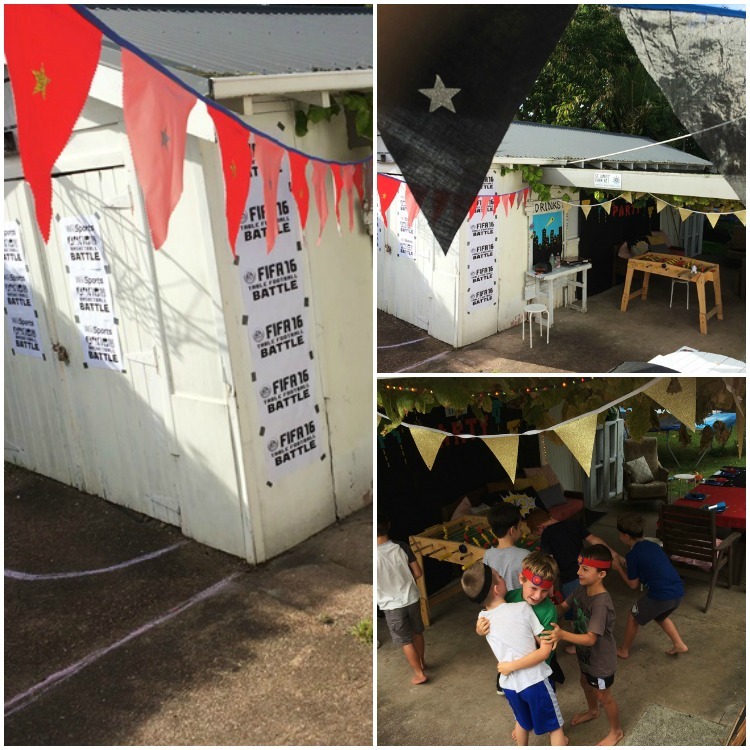 Nerf bullets flying, Big Brother and Sister joining in too (cos it was so much fun even the big kids wanted a slice of the action). Does this sound like a long party? We allowed three hours for all the fun that Scrag wanted to cram in to his epic Battle birthday. He was counting down sleeps, months out. His friends were primed and ready for action. No way could all that effort and action be given a mere two hour time-slot. We ran from 2pm-5pm and managed to do everything on Scrag's list. (I'm gonna share with you how to make this cake in my follow-up post). Happy Birthday dear Scra-a-a-ag! Happy birthday to you! Only one thing remained before we could wave our (very noisy) guests off home. We do like to send our guests home with something - a little "thank you for coming (and giving me awesome prezzies)" from the birthday kid. One of my favourite ways to do this is to hand each kid an empty treat bag, hang up a pinata, and let them smash it and then fill their bags with sweets to take home. This time I'd added in the super-cool-but-cheap imitation lego mini figures I found on Ali Express. 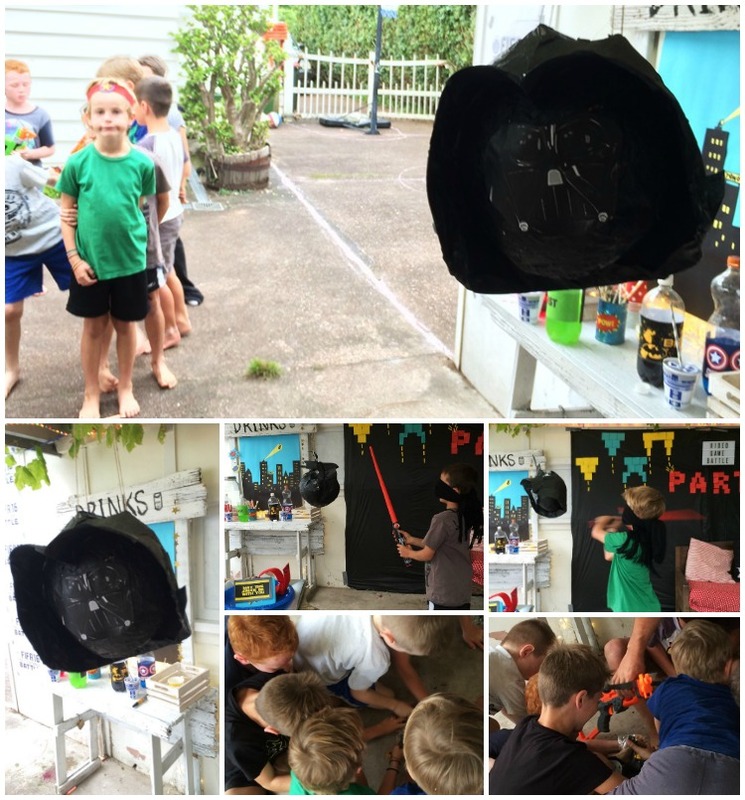 My pinata was a do-over of the Darth Vader Pinata I made for Dash's 8th birthday Star Wars party. 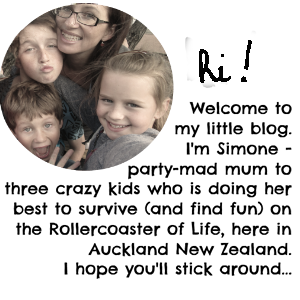 Super quick and easy (instructions on how to make here). It was a mad scramble once Darth Vader fell. Some guests scored more mini-figs than was equitable, so there was a bit of wealth re-distribution (and swapsies) until all guests were satisfied with their loot. Right on 5pm the parents showed up (bless their punctual souls!) My ears were ringing and I had taken to wearing actual ear plugs in order to survive the squealing with my sanity intact. Yes, squealing. 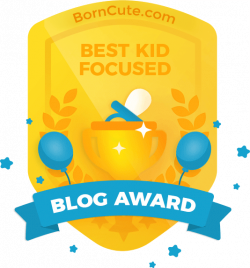 Who knew 8-year-old boys could squeal so loud?! You think girls are bad? These lads could give any bunch of girls a run for their money in a squealing competition. Which I guess just means they were super excited and having a blast. 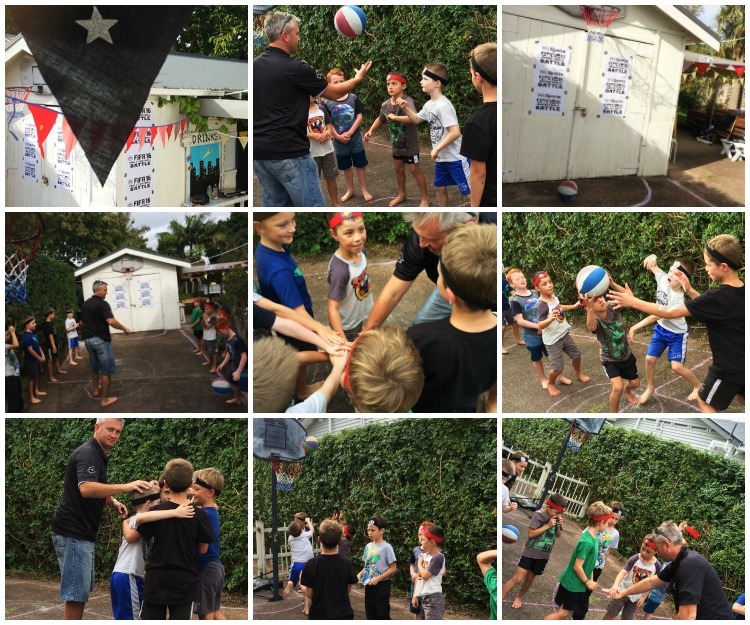 By all accounts this was Scrag's "best birthday ever" - and "the funnest party I've ever been to" (to quote a couple of comments overheard as the guests departed). Which, of course, is what makes it all worth it.